The main thing about “tail events” is how unconventional they can be, a tautology that somehow is necessary. When taking account of financial risks in 2015 it is almost convention that there are bubbles, with rather unnerving complacency about it all. That suggests in some ways the whole idea of bubbles has changed since the first one under eurodollars showed up in 1985 (junk bonds), before the dot-coms were even floated. It seems as if there is an almost cease-fire of sorts about it, namely that everyone seems to accept that financial imbalances are part of the landscape and thus promise no defectors so long as that seems a reasonable position. Such a proposition questions which part is the bubble – the financial imbalance in the first place or its transition from orderly imbalance to disorderly reversion. It seems that the latest thinking on the subject, or what passes meekly for convention, is that bubbles aren’t as such until they turn; therefore focus is on them turning rather than their existence in the first place. The world and economy are thought to be justifications of them if only in timing apart. One corollary of “secular stagnation” has developed the witticism that the global economy and the US within it actually need bubbles/high order imbalances just to grow; thus we get a bubble and then make the economy that substantiates it at some later date. And so “macroprudential policy” has been focused almost entirely in that direction, where financial stability is not the worries about financial imbalances, in every direction it should be noted, but rather the tendencies in which they might turn out very bad. We can have stock prices at historically high valuations, but that isn’t a concern until it is a concern. 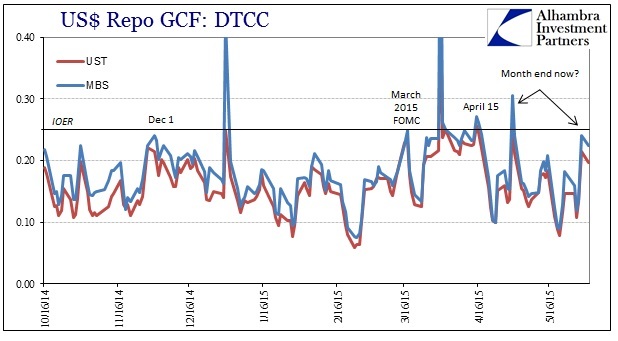 If everyone simply listened to the FOMC and the Fed Chair, followed orders and commands, it would never be so. The staff also noted changes in the structure of some fixed-income markets that could increase volatility. In addition, the staff discussed the risks to financial stability associated with the possibility of substantial unanticipated changes in longer-term U.S. interest rates, including the scope for a sharp increase in such rates to affect financial conditions in emerging market economies. At this point, it should be clear that I think efforts to build resilience in the financial system are critical to minimizing the chance of financial instability and the potential damage from it. This focus on resilience differs from much of the public discussion, which often concerns whether some particular asset class is experiencing a “bubble” and whether policymakers should attempt to pop the bubble. Because a resilient financial system can withstand unexpected developments, identification of bubbles is less critical. A number of factors appeared to limit the vulnerability of the U.S. financial system to adverse shocks. Leverage in the banking system remained relatively low, and increases in household debt stayed modest and continued to be associated primarily with borrowers with strong credit scores. Nowhere in that policy section discussing the financial situation are the words “leveraged loans” or “junk bonds.” The only mention of corporate bonds is in the positive framing (read: Fed doing a good job) of low spreads and high issuance. The word “liquidity” appears exactly once, having nothing to do with systemic problems but rather some housekeeping about renewing swaps with the five major central bank partners. If there is to be true resilience, then liquidity should be the largest part of it. The dangers of an imbalance turning to disorder rest upon the ability of the system to absorb a shift into heavy selling; prices can remain clearing at unobstructive levels so selling doesn’t snowball toward pressuring overall leverage. In that respect, the Fed and the major banks were not at all concerned about liquidity, at least outwardly, until October 15. At that point, convention was forced toward re-designation (a fact that should blast apart any notion of resilience since near-perfect foresight is absolutely required under the Yellen Doctrine), and the HFT’s and bond funds were added to the list. There are some words spent here and there about Basel and capital changes affecting dealer balances and inventory, but, publicly at least, they are kept to a minimum either out of intentionally holding the “children” unaware or, sadly quite likely as 2008 taught us, total misunderstanding of the situation. It is quite serious to see volatility in the US treasury market of late, but more so because the idea of liquidity has been drained (pun intended) of its true meaning, much like asset bubbles. A truly liquid market would look almost at random, with fluctuations small and dispersed. Yet, even a cursory survey of UST’s in the past three or four weeks has started to detect regularity. I won’t get into the mathematical theories about strange attractors and the like here (you can go here for that) other than to say regularity is the sign of non-natural conditions; in the case of UST liquidity, that would mean the very real lack of it. In short, there is no such thing as amazing coincidence. Yet here it is, in the most liquid instrument in the world, one of the most vital benchmarks in all of global finance. “Somehow” there is a regular Monday/Tuesday selloff in the 10s that is almost identical across three separate weekly patterns over the space of nearly a month. Not only is the timing the same, the narrow range into which all three are contained is nothing short of remarkable. I have plotted it below, switching the Memorial Day holiday week to the end to better illustrate this week (so far) in following the first two. This follows a nearly two-week period where the treasury market as a whole sold off almost every day at and around 1:30 in the afternoon. Some of this might be blamed on, or traced to, HFT but that cannot be the whole of the matter or else liquidity reputation here would be nothing but a sham. The computers cannot move markets every day or week in the same manner or else there is nothing but computers left (since that would imply that vastness of regular traders would simply be trading/arbitraging on the computer pattern exclusively). To my view, this is a specious and hollow appearance of “resiliency.” On the exterior, the whole appears to be stable, after all the 10-year rate has really never challenged the FOMC’s convention about financial risk, staying contained at around 2.30%. The regularity at which that has occurred, however, more than suggests inner turmoil. 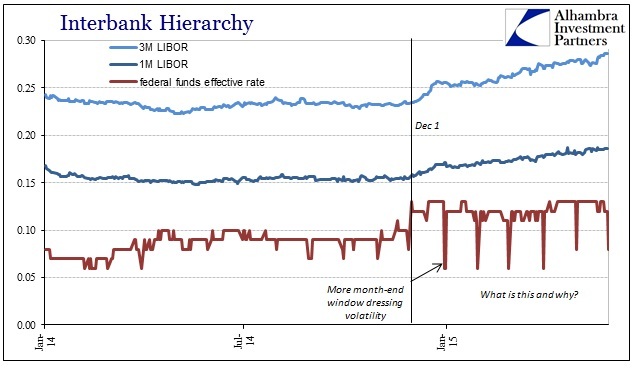 It is no surprise, then, to see the same kind of regularity break out in interbank “liquidity.” Going back to the start of 2015, the effective federal funds rate suddenly possessed itself of a large month-end pattern of window dressing where one hadn’t really existed before. This came after that mostly dead market had been awakened enough to recognize the massive bearish shift toward illiquidity that swept the globe on December 1. 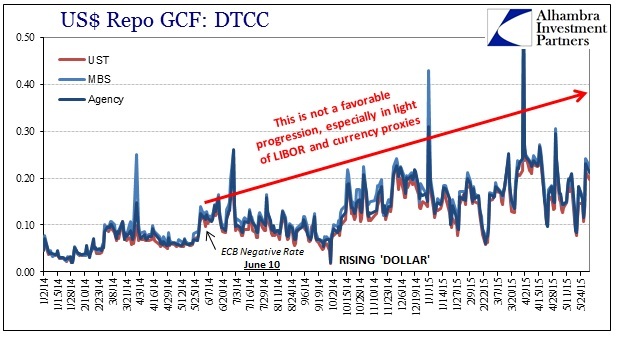 At the same time, eurodollar rates (LIBOR) have been rising rather steadily which suggests that whatever is “forcing” the monthly pattern is just the most visible and outward signal of gathering illiquidity. The overall rates and published ideas about the inner workings remain quite placid, even where concern is expressed, but what this shows is that deep within the recesses of multi-dimensional factors there is great stress. The fact that we cannot know for sure, or even observe directly, the “dollar” and all its components directly questions the idea of resiliency from the its very start; the Yellen Doctrine is about taking away all doubts, while large unobservable spaces are the very creature of doubt. 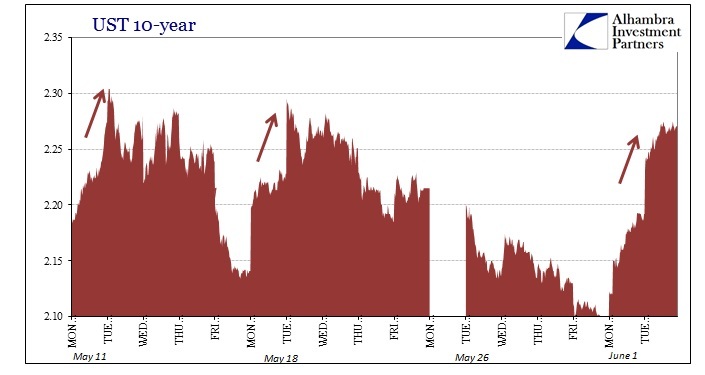 Even the repo market has taken to the same stain, as now for consecutive months a repo rate spike has appeared at month-end when it very rarely did so before (the most prominent being May 30, 2014). There had been quarter-end and year-end repo spikes (with March 31 as the most severe since 2008) going back, not coincidentally, to the taper drama in 2013, but month-ends apart from quarter-ends is entirely new. 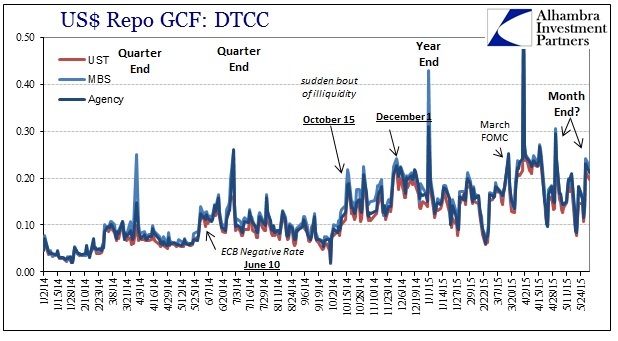 In fact, as you can plainly see below, the dynamic of repo rate behavior (usual caveat here: this is only GC repo and only what is reported by DTCC, meaning there is a great deal still left hidden so the general assumption I am making is that these DTCC figures are enough of a proxy or representative of repo overall) changed at May 30 last year, prefiguring very closely the “rising dollar” that is the most prominent financial means of stress and economic transmission in perhaps this entire “cycle.” When Janet Yellen was assuring everyone last year that financial bubbles were no problem because economic success was assured, financial liquidity turned in a manner that may, in the end, make such assurances even more foolish than they were on QE’s record alone. Because all of this falls outside of accepted convention, including even the reluctantly expanded version that was forced to account for the events of October 15, it is, like 2007 “aberrations” in ABX, ignored in favor of maintaining outward projection of calm and stability. The Yellen Doctrine has to survive, after all, because there is nothing else! Not even the economy provides support right now, meaning that all those imbalances and, yes, bubbles that were going to be ex post facto vindicated by a robust economy are in danger of being recalibrated with a higher probability of failure and actual loss. At some unknown threshold, especially where valuations are the most insane and rationalized (insanely), that probability triggers the natural human instinct from risk to preservation. If it “got out” that there was really no liquidity with which to support even that, the probability of the one aspect the Yellen Doctrine has assigned itself, bubbles to busts, becomes more than paramount and more than localized. Without a recovery, the only thing left in place for this bubble-existence is the fantasy of resiliency. It was always a dream to think you could support bubbles on just the promise of future success, but that task becomes impossible when factoring such frailty in financial support. Low and non-existent liquidity with an immense financial component means that a smaller actual change in trend will create the spark that unravels it all; meaning an increase in the probability of unraveling. In its most basic form, the Yellen Doctrine means to keep the herd from ever turning, but so far the lack of economic success has already started that turn (October 15; January 15). Of course, the framework of this discussion is all wrong to begin with, as the rightful argument is not about the dangers of the herd turning but rather in actively seeking to corral the herd in one direction in the first place. The regularity of funding “leakage” is just confirmation that it was foolish to ever try to begin with, especially since so much of the systemic wreckage is traced to none other than QE itself. In other words, in an almost cosmic fractal image, QE is itself the author of the greatest bubble and its ultimate (potentially, I am obliged to write) end.